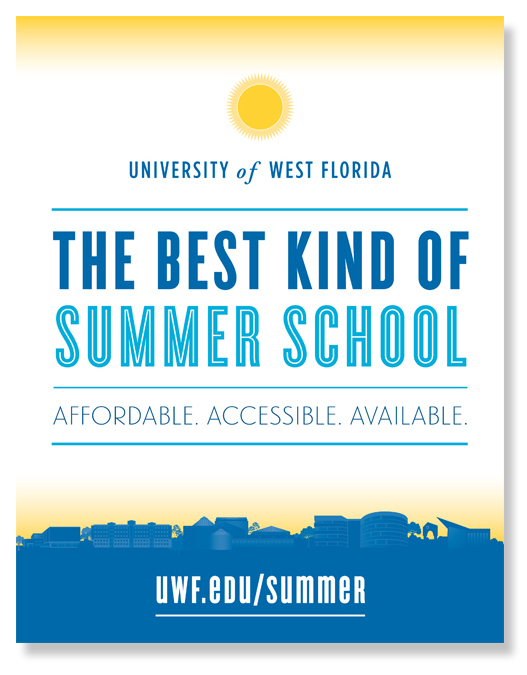 The University of West Florida’s 2014 Summer Recruitment campaign was done as an effort encourage student to enroll and take advantage of the summer schedule. This efforts were put into affect by on and off campus advertising. Students were greeted with posters and retractable banners around campus common places such as the Commons, Library, and the larger College Buildings. Students were also welcomed with statically placed billboards around the city. As part of an on-going personal engagement effort across campus, teachers were provided with flyers to have in their classes and offices to talk one-on-one with students about the different options available to them and have postcard take-aways to leave them with. The over all campaign sought to have a warm fun feeling to off-set the negative connotations of what summer school was in high school. These was accomplished by using light hearted vector graphics and high-impact typography. 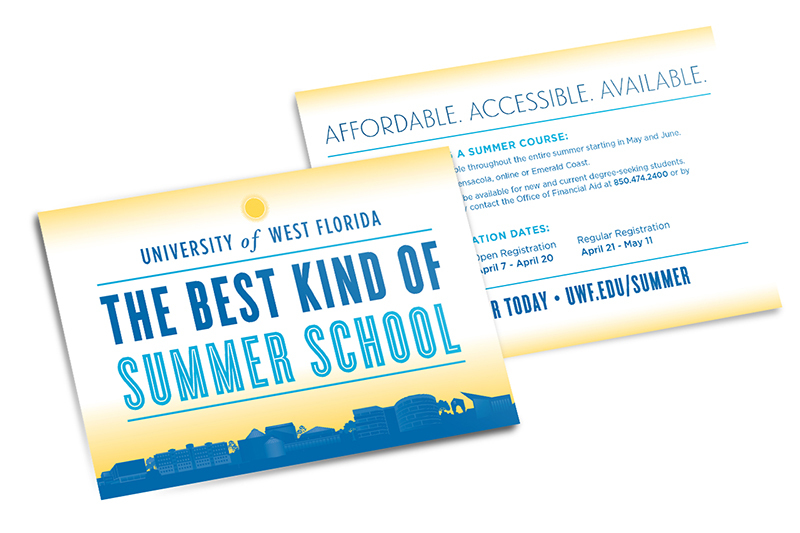 The color palette chosen used the Universities primary blue color accented with a lighter blue and sunshine yellow. 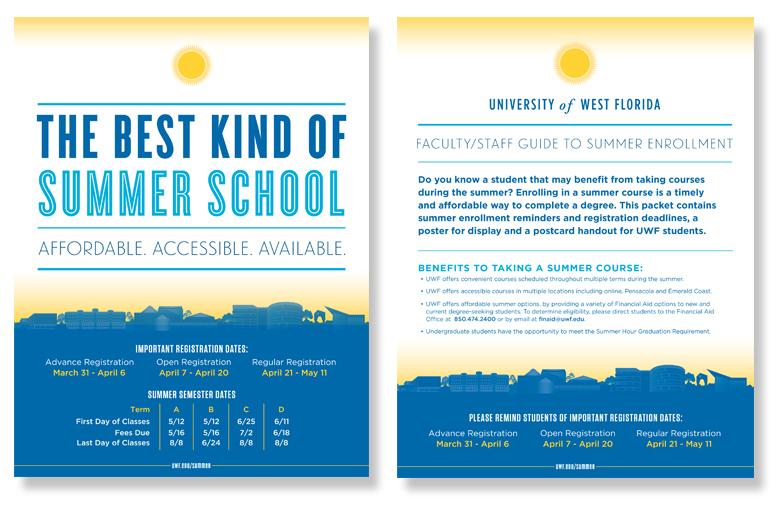 24″x36″ Poster printed on hi-quality semi-gloss paper placed around the campus in high foot traffic areas. Flyers given out directly to teachers to have in classrooms and offices to provided student with more details about summer schedules. 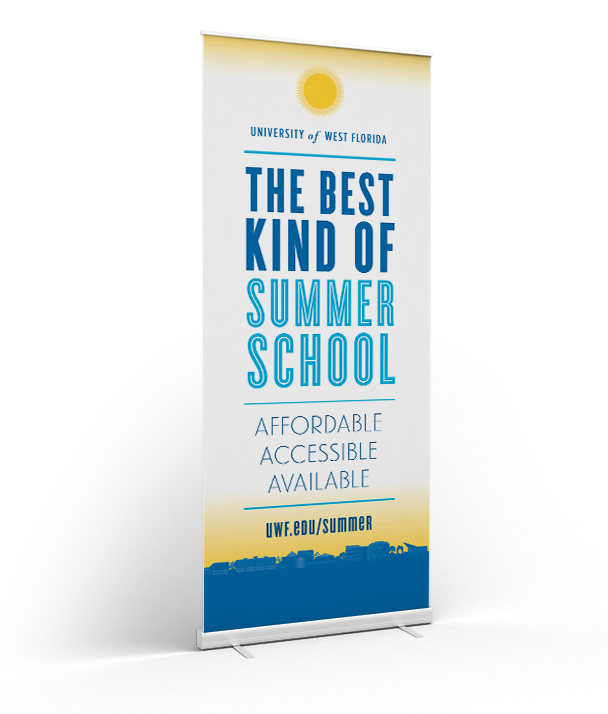 80″ retractable banners were placed in the University Commons and Library to be a large eye catching advertisement. Take-aways given to teachers to hand out and placed near posters and retractile banners for students to have something tangible to take with them.